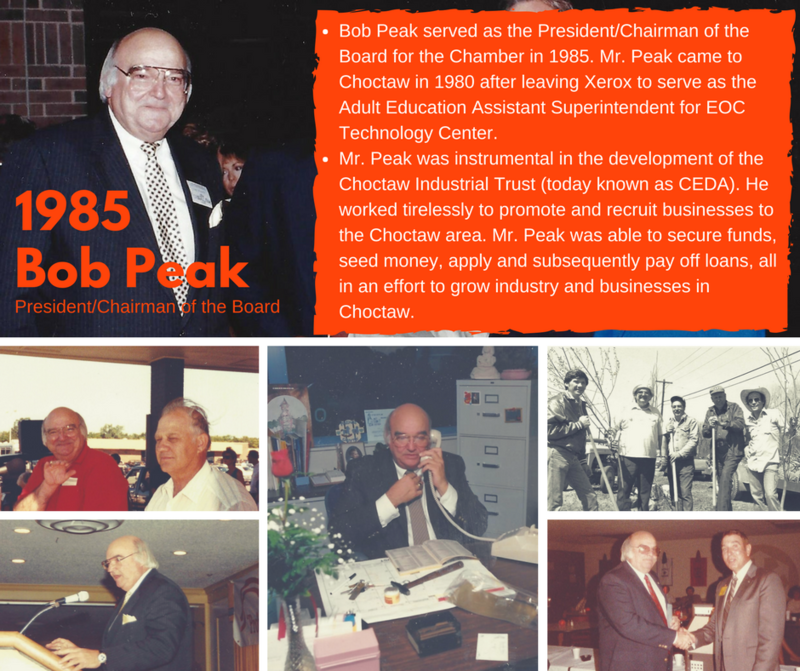 In 1985 Bob Peak served as the President/Chairman of the Board for the Choctaw Chamber of Commerce. His leadership within the community included, acting as Chairman of the Choctaw Industrial Trust, President of the Choctaw Chamber of Commerce, Board Member for the Mid-Del Youth Association, and Rotary Clubs International. Mr. Peak also served as the emcee for the Choctaw Parade, he dressed as Benjamin Franklin for the Christmas Day Parade, he worked on John Whetsel’s campaign, he was the Honorary Chairman for Miss Choctaw Pageant, and he helped plant trees along the railroad tracks on 23rd Street. Mr. Peak’s involvement and dedication to the Choctaw community is much appreciated. It is because his vision and determination that the Choctaw Industrial Park exists as well as the Choctaw Industrial Trust, now known as CEDA. Mr. Peak remained active and involved in our community until his death in June 2006.